If there’s no rest for the wicked, then Mark Dolan must be a very bad man. Not content with writing, producing and presenting for both television and radio on such successful efforts as Balls of Steel and the Weekly Show, the bespectacled comedian has recently decided to return to his stand-up roots, and after a run of successful previews is bringing his debut full-length work to Edinburgh. I’m Here to Help! is designed to make audience members laugh and sort out any problems they may have; from cats who won’t stop urinating in kitchen cupboards to hair neuroses and overly jealous other halves, Dolan has heard it all and is keen to have a crack at more. The well-spoken, self-deprecating and extremely witty chap seems genuinely excited about his latest venture, not least because it allows him to return to Scotland’s capital city. I’m Here to Help! is the result of an idea which came to him while out jogging in ‘very short shorts and an ill-fitting top’. It involves audience members filling out a form before the show detailing a problem in their lives. Dolan then invites a few on stage to try to solve their problems. All going well in Edinburgh, Dolan eventually hopes to be able to combine his current broadcasting work and stand-up stints with an I’m Here to Help! tour of the UK. However, after dozens of odd jobs throughout his varied career including everything from radio producer to selling pensions, telesales, performing in front of drunk punters in his parents’ North London pub as a child and working in a nightclub where he ‘constantly wore a thick tweed jacket and stuck out like a sore thumb’, he has recently set his mind to achieving one more major goal. ‘I would love to be able to combine what I do live with television and develop a format for that. So what I’m really saying is I’d like to do I’m Here to Help the TV show.’ Watch this space. Mark Dolan: I'm Here To Help! In debt? Partner left you? Dry hair? 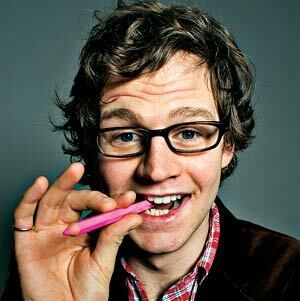 Mark Dolan is here to help! Unfortunately, he might not do much to make you laugh in the process, in this irredeemably bland interactive show. 'Part of the Edinburgh Festival Fringe 2007'.